White is one of the most classic of interior design looks, as it’s quiet, serene and doesn’t demand attention. 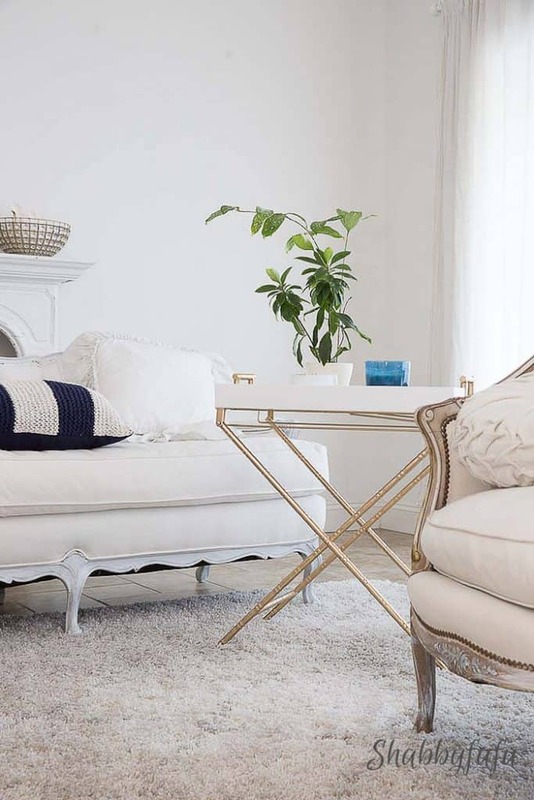 White is so stylish and inviting and sets the base for so many looks from coastal to farmhouse to elegantly chic. For whites in furniture that are fabulous and yet functional, slipcovers are the ultimate solution. I have raised my children in our Miami home and at our beach home we often entertain and washable white slipcovers always do the trick and look great. My sofa and love seat at the beach are from Pottery Barn and have stood the test of time so far and are comfortable as well as fashionable. I have yet to wash the slipcovers opting instead to place a pad that I’ve sewn up for each from an inexpensive matelasse coverlet. I do launder these and we vacuum the sofas as needed to remove pet hair. I did order a second set of slipcovers when we purchased the white slipcovered Pottery Barn sofa and love seat, just so that I have them for the future. Another option is to use outdoor fabrics when selecting seating, or forgiving white leather. I love how white is so easy to accessorize with and change out the look with pillows and throws. 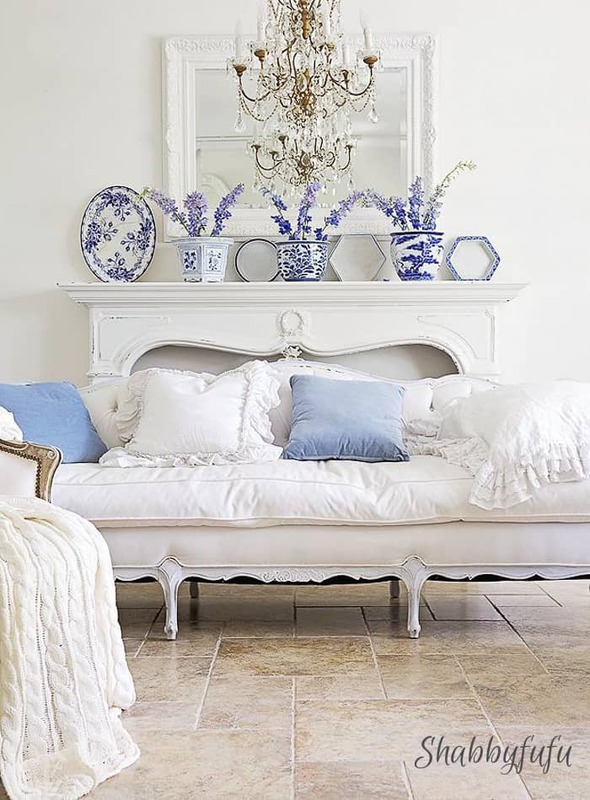 this blues of the accessories in this summer styled room just pop against the white and the darker floors. You’ll still maintain that sense of harmony with using a white base and encourage flow from room to room. Lots of texture with the chunky cream throw and the layers of ruffles on the pillows bring some depth. When hanging out on this extra long vintage French button tufted sofa that I recovered in white denim I don’t worry about the white. I had the bottom cushion made with a zipper so that if it needs to be removed I can and then toss in washer. 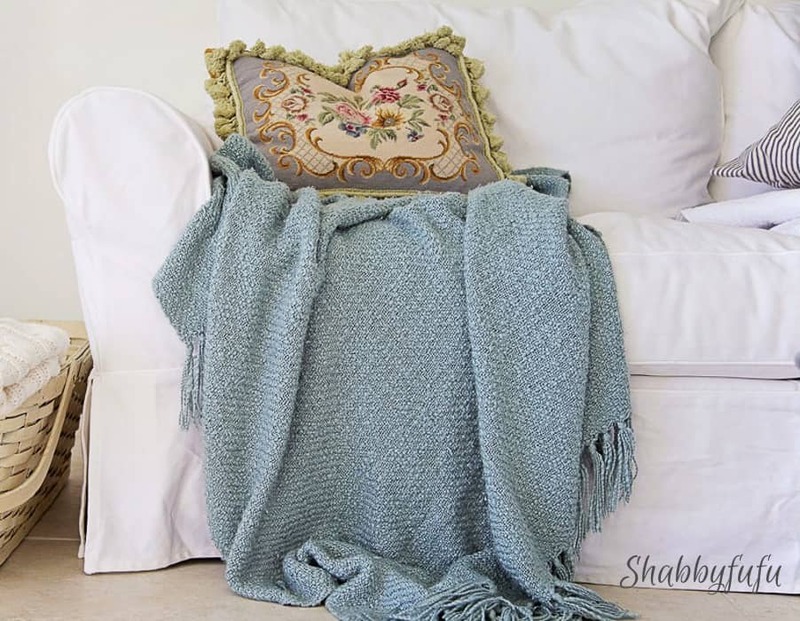 Choose a heavy duty twill if you are creating slipcovers and they will wear like iron, as this has. 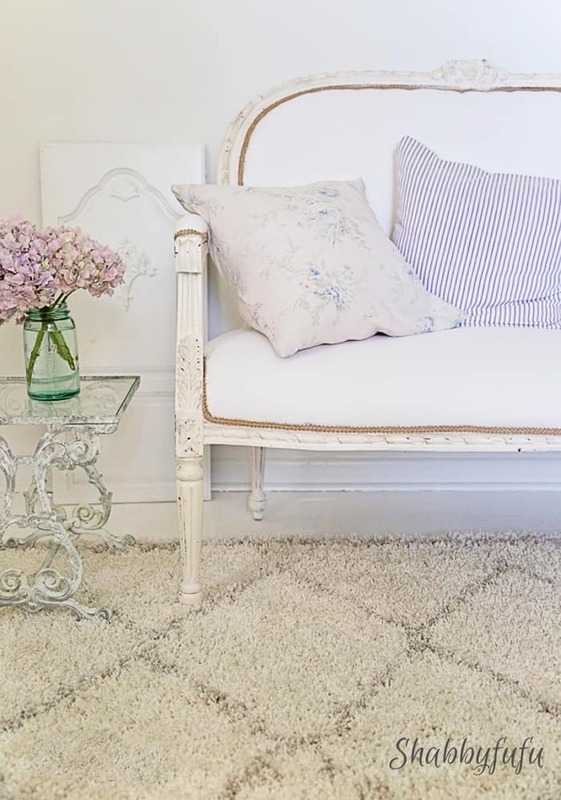 Texture and interest with vintage and new in white and cream in my French style home office. Yes, there are often muddy paws in here and that’s okay. I feel that with white you can easily see where the dirt is and with dark color the dirt is still there…but hidden. Read on for a few cleaning tips that have stood the test of time for this long time homemaker. Although this room is getting a makeover and the bedding will be changed, white is fresh and casual and will never go out of date. There is nothing as soothing as sleeping on crisp white sheets and simply changing them out when worn can give your bedroom a whole new look and feel. I purchase hotel bedding for our home and look for a medium thread count and all cotton to keep clean easily. I’m not a cleaning expert but have been a homemaker for many years and started my antiques and vintage selling business selling linens. Here are some simple tips that work for me and have stood the test of time. Our sheets and towels are all white and are washed weekly. I don’t use chlorine bleach because it weakens the fabric and shortens the life span of linens. Use the hottest water that you can and one of my favorite products for bed linens and towels that need some extra oomph in whitening is Oxiclean powder. Less is more and I give them a longer soak in the washer (sometimes with a cup of baking soda) and occasionally a white vinegar rinse to remove any soap build up. Weather permitting, dry in the sunshine and if possible…lay on the grass. The chlorophyll will act as a natural brightener to the white. *Never use fabric softeners or spray starch when storing fine linens, as it can cause them to yellow over time. If you do get a stain on your white slipcovered furniture and don’t feel like taking off for washing, I have had success with several methods that you could try. A spray and wipe off of Oxiclean Stain Remover directly on the spot as soon as you see it generally works well. If the stain has been sitting there awhile take a toothbrush and some hot water after spraying and work it out, taking care not to damage the fabric. Oxiclean powder or Biz are some cleaners that I always have on hand too and make into a scrub for larger stained areas (muddy paws). Do you have any favorite tips to share on living with white and keeping it clean? I’d love to hear from you! am using a folded twin cover now but like the idea of a pad. Thank you. Thanks for stopping by Mary and you’ll see a photo actually in tomorrow’s post that I’m working on! Sounds great. I’d love to see the pad also. I thought I was the only person who did things like this. Ha Your home is beautiful and love all the tips !! Thanks Kathy! I don’t have a good close up shot of the pad, but I cut a mattelasse bed cover in half and serged the sides so that it wouldn’t fray. A toss in the washer/dryer every couple of weeks keeps it clean! Janet I have been taking baby steps to add white to my home now that the kids are grown and I really appreciate these tips on how to keep things nice and clean. One of my favorite things about white is that you can SEE where the dirt is! Janet- this blog couldn’t have come at a better time. I just purchased an antique French sofa and want to reupholster in white. Can you tell me a little more about the fabric you chose for your French sofa? Also, did you paint it as well? Thanks. Love your home! Patricia…I did paint the wood with a gray wash and the fabric that I chose is a heavy duty white twill. Wears great and the cushion is slipcovered to wash! Thanks for this post. I love using white in my home and have been adding more and more of it. I especially love the tip about the chlorophyll! I’m dying to know where you got that mint cable knit throw on the bed? You can’t go wrong with white Sue! That throw is from Annie Selkie Pine Cone Hill but I’m not sure if they still carry it? It is difficult to tell without photos, but white pretty much goes with everything and can tie a room together. Where do you buy your sheets? Do you have a link for sheets? I think white slipcovered furniture is perfect for coastal looks or really any decorating style! We have extremely hard water here Sheila and Mrs Stewarts Bluing helps to remove the dingy yellow. Have a wonderful day! So many great tips! Thanks for debunking the fear of living with white! I get so many anti-white living comments…but to me it’s the easiest way to live cleanly!